With the holiday season approaching our thoughts typically turn to sharing time and memories with family and friends. Food and heritage are often a big part of the festivities. Here are five ways to share your family recipes and traditions. My mother had dozens of cookbooks and several card file boxes stuffed with 3 x 5 recipe cards. 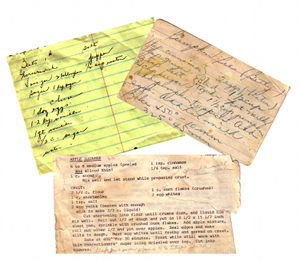 She even wrote recipes on scraps of paper or napkins. These items are treasures because they are in my Mom's handwriting, but most are starting to fade and tear, so I made a point to scan and organize them. My favorite tool to use for this is Evernote because of its powerful search capabilities. To aid in the search process, you can easily tag your recipes. You can speed up the scanning and entering process significantly by storing them in one folder and then using Evernote's handy import feature. To learn how, read the tips found here. Evernote also makes it easier to share recipes with others. Check out the Relatively Curious About Genealogy Blog for suggestions. Seems like everyone is joining the "pinning" craze these days, especially on Pinterest--an online pinboard where you can organize and share the things you love. You can sign up for a free Pinterest account and then "pin" your favorite family recipes and traditions to boards you create. This is a quick and easy way to share your favorites with others--family, friends, and, yes, even complete strangers!) You can also search for "Family Recipes" and "Family Traditions" to see what others are posting and "repin" them! My mother and grandmother were fantastic cooks, and the traditional foods they prepared from my Slovak and Rusyn heritage are among my favorites. 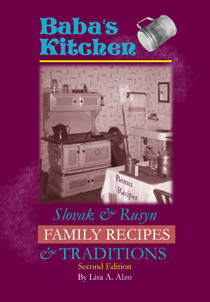 To preserve and share theses recipes and traditions, I published a cookbook, Baba's Kitchen: Slovak & Rusyn Family Recipes & Traditions (now in its second edition and available via Lulu). With today's technology and digital publishing options, it's easier than ever to create your own cookbook to give as gifts or to sell. By opting for print-on-demand and/or eBook versions (through Lulu, CreateSpace, or Smashwords), you can easily revise and update them. If you're an iPhone or iPad user and save your recipes in Evernote as suggested above, you can use the handy EverEPub app (iOS $3.99) to create an ePub book from your Evernote notebook or tag collection (read more about this at Moultrie Creek Blog). Not ready to tackle a complete book? Share your recipes via your blog. Consider using your favorite family recipes for craft projects that you can use as decorations, or for birthday and holiday gift ideas. Some examples include recipe gifts in mason jars, framed recipes, or even tea towels. I found all of these ideas on Pinterest and you can find others there, too. What good is a recipe that's just sitting in a book, your computer, or "the cloud"? Your preservation should have a purpose. Set a goal to try and make one or more of the recipes you've saved for your next family reunion or holiday party. If you have relatives living close by, invite them over for a "family dinner night" and if you make it a potluck, you can challenge each person to make a different dish. This can be a new tradition created from old ones! If there is a particular tradition you remember from childhood (such as hiding Easter eggs around the house or watching the Macy's Thanksgiving Day parade while you make stuffing), share these with children, grandchildren, nieces, nephews, etc. In my family, we always celebrated a special Christmas Eve (Vilia) supper with my grandmother and prepared special (meatless) dishes. My grandmother has long since passed away, but I still observe this tradition in my own home. Don't use distance as an excuse. With a little imagination and by utilizing technology such as Skype or FaceTime, you can even include far-flung family in your Sunday dinners or other celebrations! If you're really ambitious, consider recording the cooking session for a video you can share, perhaps via YouTube, to inspire other family members. Recipes and traditions are as much a part of a family history as the names, dates, places or other facts we gather while tracing our ancestry. These treasures can bring back many wonderful memories for you, and provide something meaningful to pass on to future generations.